This is a three-dimensional culture of human breast cancer cells, with DNA stained blue and a protein in the cell surface membrane stained green. 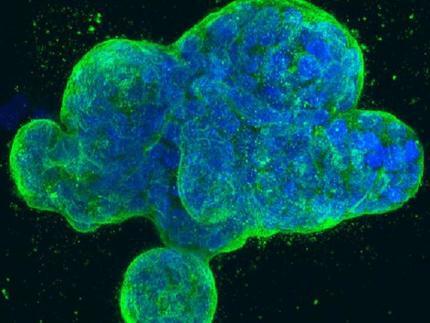 08-Jan-2019: Researchers at University of California San Diego School of Medicine report that detection of "copy editing" by a stem cell enzyme called ADAR1, which is active in more than 20 tumor types, may provide a kind of molecular radar for early detection of malignancies and represent a new therapeutic target for preventing cancer cell resistance to chemotherapy and radiation. "We were able to illuminate the abilities of ADAR1 to 'hyper-mutate' tumor suppressor RNAs in leukemia and, at the same time, edit the microRNA aimed at targeting the tumor suppressor RNA. This enzyme turns on cancer resistance via a domino effect on RNA instead of DNA," said first author Qingfei Jiang, PhD, assistant project scientist in Jamieson's lab.